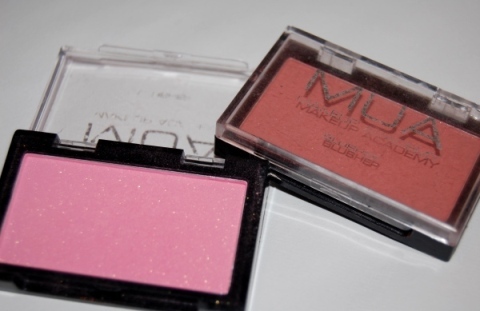 I decided recently to make another MUA Makeup Academy post to show you my £1 blushers. Please note that when these products are brand new they will not look this battered! I'd probably describe this packaging as 'functional' and for £1 you certainly don't get and bells and whistles. Mine have been with me for quite a while now but here is a quick shot of what they look like at a glance. There are 4 shades available currently in the collection and on the left here is shade 1 with shade 3 on the right. To me they look like a cool bubblegum pink and a deep apricot tinged flush both with a decent helping of glitter particles (visible in the pan of shade 1). Although normally the glitter would be a let down for me it normally isn't that visible when worn! The shades apart from the glitter particles are relatively matte! Now although the packaging isn't really that exciting the real reason I bought these products was for experimentation! I've always had a pink complexion at the best (and worst) of times so with a little too much sun in the summer or wind in the winter I can end up looking bright red in an instant! Only recently did I dare to venture into the world of blushers and these shades were the ones I started with. Now this is a heavy swatch but you can get a good idea of the true tones from here. 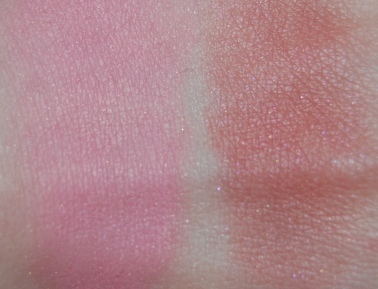 Shade 1 (on the left again) offers a sweet pink flush while here you can see the apricot undertone to shade 3 which is slightly too dark for me. The fine glitter is visible here but I don't tend to see it at much when I wear these shades because I use them so sparingly! Perhaps best used sparingly, these shades can provide a nice healthy tint to my cheeks. I favour the lighter Shade 1 and wore it in my FOTD dusted lightly over the top of my cheeks. My qualms are that they can be quite chalky and although I'm no expert I find them really tough to blend. My technique for these is building the colour up slowly rather than trying to blend them out! Also there can be quite a lot of fallout in the pan so be careful with that brush! As I am so pale I have to say I like the idea that I can give my complexion an easy little boost with a £1 product! I wouldn't say these are as impressive as some of MUA's other offerings but I don't regret buying them because a little can go quite a way! Great post, they look very pretty and for such a low price I think I will check these out! @Summer The pink blush is lovely. I'd highly recommend a lot of things from their range!